Three stories: one set in England of the 1850s, one set in the US in 2007, and one in China in 2098. All of these stories have common themes - bees and the relationships between parents and children. 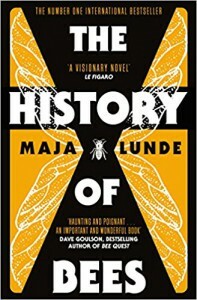 There was a lot of promise in the beginning of the book, which described a world in which bees had become extinct and the pollination of plants had to be carried out by people in back-breaking labour instead. The descriptions of this potential future were harrowing - food shortages, oppression, everything you could want in a dystopian setting. yet, there was some humanity also in Tao's struggle to find out what happened to her son. The other two stories were less interesting. They also dealt with bees and the illusions that parents may have with respect to what is best for their children, but at about the half-way point in the book, both stories became a little predictable and stagnant. Still, this was not a bad read for a debut novel. But it just wasn't enough to make me rush out to find more by the author anytime soon either. Btw, there is not actually that much about the history of bees per se in the book. Just as a point of note.